Members join an organization for a variety of reasons. It might be that you want to volunteer and give back to your community, or it might be that you would like to get to know the women in your community. Whatever the reason, we all want to work together and be good members to support our community. 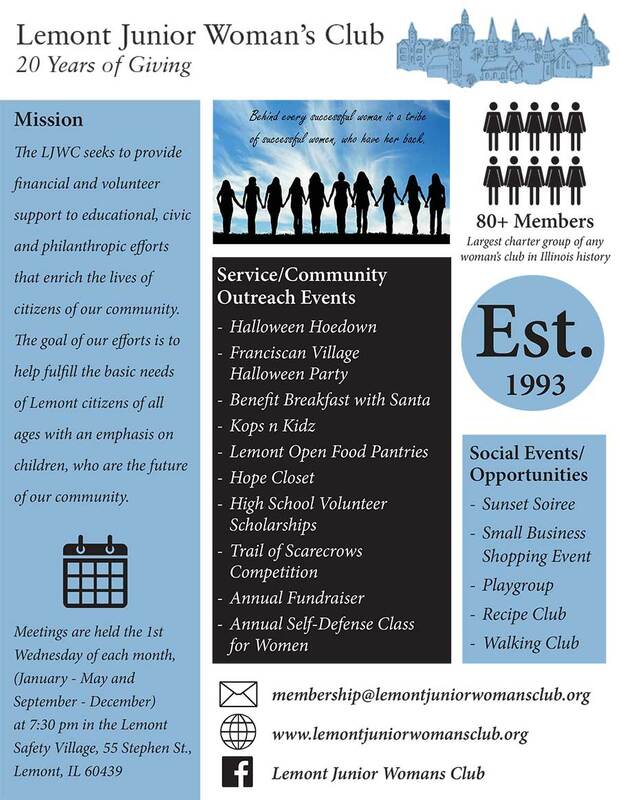 Being a member of the Lemont Junior Woman’s Club ( LJWC) we have general meetings the first Wednesday of every month. As a member you are required to attend at least 1 out of 3 of these meetings quarterly. Within LJWC there are multiple committees you can be involved in. You will be placed on one of the committees based on your choice of the following options: 1.) Membership, 2.) Philanthropies, 3.) Ways & Means, or 4.) Community Outreach. Other special talents and interests you can be involved in include: (Ex: Event planning, Fund Raising, Website Management, Playgroups, Recipe Club, Book Club, Social Events). Your role as a committee member is to attend committee meetings when your committee head schedules them. We also require that you head up at least 1 event, or volunteer to help out with 2 or more events throughout the year. If you are interested in becoming a member of LJWC and joining our wonderful organization, you must complete the Membership profile as well as pay a $55 annual dues fee. Please contact us for further information on joining LJWC at ljwcmembership@gmail.com.